How to increase deadlift weight and benefits is the question of the day. We need some answers to get stronger in mind & body. If we can deadlift more weight, then we will build more muscle to handle that weight. First, get into the habit of deadlifting once to twice a week without fail. This is the first tip for how to increase deadlift weight and benefits. Without a good habit, how can we ever hope to achieve anything? If you are not clear why you should even bother doing deadlifts, take a look at the benefits of deadlifts, this is why you want to know how to increase your deadlifts! Second, make sure that you start with a light weight, I started with 55 pounds a couple of months ago. 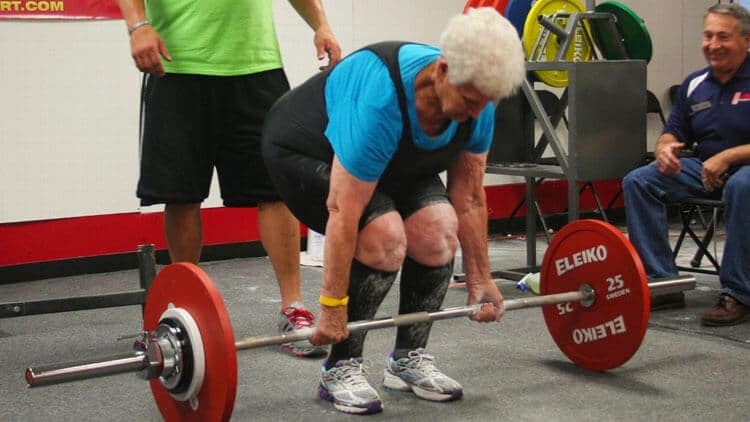 Hey, don't laugh, I am already over 50, so I am grateful that I can even do one deadlift of any weight! In any case, start with a light weight! Make sure to practice proper deadlift form. To tell you simply, stand above the bar, squat down and take a good shoulder wide grip. Keep your shoulders directly above the bar, wrap your thumbs around the bar. Hold tight, keep your back straight, take a deep breath, lift the weight up by driving your legs and return to the floor and repeat. Mehdi of Stronglifts has a great article on proper deadlift form, so make sure to check it out as this will help you to increase your deadlifts safely! Increase your deadlift weight gradually. As I mentioned above, I started with 55 pounds, I would have started with 45 pounds, but I need some room to put my hands under the bar. In 8 deadlift sessions, less than 2 months, I increased my deadlift to 135 pounds. So, increase your deadlift weight gradually. Don't be a big shot, even a 5lb increase is great! When you load up on too many carbs, you will see it will be harder to workout. So, great sleep and real food like vegetables, fruits and lean proteins will keep you feeling great. That's how to increase deadlift weight and the benefits that go with a stronger deadlift.